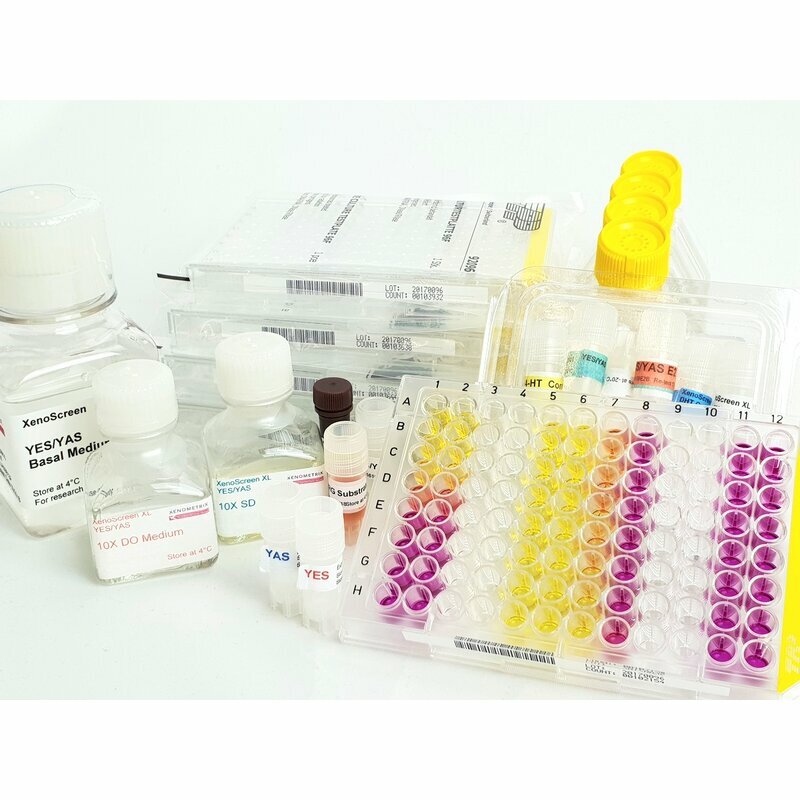 Ready to use Estrogen and Androgen Receptor Transactivation Test Kit for the Identification of Estrogen and Adrogen Receptor Agonists and Antagonist in endocrine disrupting chemicals, agrochemicals, cosmetics (EDC's) or in waste water. In compliance with OECD Guideline TG455. The kit can also be used for measurement of agonistic activity only. Number of samples: 4 samples in 4 different receptors (ER, AR, Agonist and Antagonist), in duplicates, 8 dilutions or for 32 samples in 4 different receptors in 1 dilution. Allows for measurement of only 1 receptor activity whereby 4 times more samples can be measrued. Strains are not included in the kit and are available separately. Many endocrine disrupting chemicals adversely impact the estrogen or androgen signaling by interacting with estrogen or androgen receptors. The receptors show ligand selectivity and target gene regulation, they modulate metabolic enzymes that are critical for normal estrogen or androgen synthesis and metabolism. Typical EDC's are e.g. phytoestrogens, bisphenolics, and organochlorine pesticides. Many endocrine discrupting chemicals act through multiple mechanisms and therefore biological effects of EDCs need to be carefully interpreted.